In the 1800’s, paddle-wheelers were described as floating palaces. Today, in Branson, Missouri, you can experience the joy of exploring the beautiful Table Rock Lake on a majestic paddle-wheeler named The Showboat Branson Belle while enjoying a multi-course dinner and a show! After our dinner cruise aboard The Showboat Branson Belle, we spoke with Showboat Branson Belle host and comedian Christopher James. Can you describe The Showboat Branson Belle in one sentence? The showboat is the ultimate vacation experience, a cruise, a meal and a show all in one! What is your role at The Showboat Branson Belle? I am similar to a cruise director acting to welcome guest, make their experience as worry free as possible, introduce our amazing performers, and of course entertain. 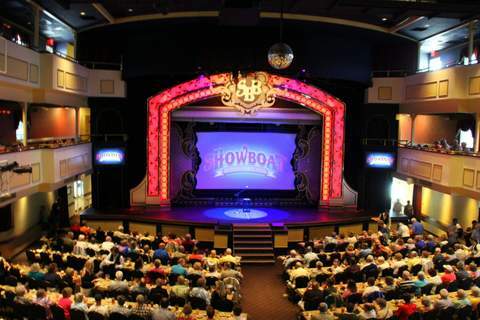 What acts perform on The Showboat Branson Belle? Cassandre is our featured female vocalist, the five member Showmen, dance group Rhythm, the Rockin’ Dockers band and of course me as host and comedian. What do you love most about performing on The Showboat Branson Belle? Every show is a new experience for me because I interact with the audience so much. No two cruises are ever the same. In your opinion, why are Branson and its attractions so popular? Variety! Branson truly does offer something for everyone. It has changed so much on the past few years and continues to evolve. We enjoyed our dinner cruise aboard the $8 million Showboat Branson Belle. Whether we were enjoying the food, comedy, magic, music and dancing or roaming the decks for the 360 views of Table Rock Lake, our dinner cruise experience was unique, relaxing and entertaining. Christopher James is the perfect host / emcee for the show, He seems to enjoy every second of his time on stage and interacting with the audience. “This is how we do salad. Take that Olive Garden!” he boasted humorously as salads were served to dinner guests. His “Yes No” audience participation game – somewhat like the Simon Says game of your childhood – had the audience both laughing and cheering. Featured female vocalist Cassandré Faimon-Haygood is comfortable belting out tunes from “Downtown” and “Feelin’ Groovy” while wearing white, knee high go-go boots to joining with The Showmen for a selection of twenty-seven songs in nine minutes and even some Disney tunes. The Rhythm clogging and dance group is known as The Fastest Feet West of the Mississippi. Our meal included salad, dinner rolls, choice of beverage, choice of entrée and dessert. We enjoyed our dinner cruise aboard The Showboat Branson Belle. If you are a fan of dinner theater entertainment or historic ship replicas, make sure you visit this Branson, Missouri tourist and local favorite.